With the advent of computer animation, animating by hand has slowly started fading out of the limelight. However, Tim Burton has never been one to follow a trend. Known for his quirky, offbeat style of storytelling, one of Burton's most popular works is one he didn't even direct. Released in 1993 to little fanfare, the Burton-produced The Nightmare Before Christmas has since developed a devoted cult following while becoming very respected for its achievements in stop-motion animation. Twelve years later, Burton returned to the world of stop-motion animating when he co-directed Corpse Bride, a spiritual sibling to The Nightmare Before Christmas. Burton's unique depiction of an unconventional love triangle, this "tragic tale of romance, passion, and murder most foul" opened in the fall of 2005 to nearly unanimous critical approval. But just what does this critic think? Our story is set in a gloomy, oppressive village in 19th-century aristocratic England, on the eve of an arranged marriage between Victor Van Dort (Johnny Depp) and Victoria Everglot (Emily Perkins). His nouveau riche parents (Tracey Ullman and Paul Whitehouse) have money, while her parents (Joanna Lumley and Albert Finney) are high class yet destitute, so this marriage is more for them than the betrothed. Neither are exactly ecstatic about marrying a total stranger, but when Victor and Victoria meet for the first time prior to their wedding rehearsal, it's love at first sight. Unfortunately, the rehearsal is a disaster, as Victor's nervousness gets the best of him. He can't remember his wedding vows and nearly sets Victoria's mother on fire after dropping a candle, prompting the frustrated Pastor Galswells (Christopher Lee) to throw him out, telling him not to come back until he learns his vows. Depressed, Victor wanders into the forest to practice his vows. He finally manages to say them perfectly, placing the ring on what he believes to be a gnarled tree root. However, to Victor's horror, that gnarled tree root reaches out and grabs him. That root turns out to be a skeletal hand belonging to Emily (Helena Bonham Carter), a murdered bride waiting for a groom to sweep her off her very dead feet. She declares Victor her groom, whisking him away to the fantastical Land of the Dead. Initially reluctant to accept that he's married to a corpse, he convinces Emily and the elderly town chief Elder Gutknecht (Michael Gough) to return them to the world of the living under the false pretenses of introducing her to his family. He sneaks into Victoria's boudoir and confesses his love for her, while Emily enters the room at the same moment. The jilted cadaver spirits herself and Victor away, leaving Victoria behind to helplessly watch. While Victoria pleads for help from Pastor Gaswells and her parents, they simply believe Victor ran off with another woman and start working on another arranged marriage between Victoria and a presumably rich stranger named Lord Barkis Bittern (Richard E. Grant). Unbeknownst to everyone else, Barkis is only marrying Victoria with the intention to kill her and make off with her family's (unknown to him, nonexistent) fortune. Meanwhile, Victor's newly deceased family chauffeur Mayhew (Paul Whitehouse in a dual role) arrives in the Land of the Dead and delivers the news of Victoria's impending marriage to Barkis. Believing that she's willfully marrying him, Victor is heartbroken, but begins growing closer to Emily. He ends up totally falling for her, agreeing to ingest poison as part of a ceremony in the Land of the Living to make their marriage official. The residents of the Land of the Dead arrive in the village, and in the ensuing chaos, three discoveries are made. Barkis discovers Victoria is poor, Victoria discovers Victor's intentions to become the Corpse Groom, and Emily discovers who left her to die. Everything comes to a head at the local church, where Victor must finally choose between his living bride and his corpse bride while protecting both from Barkis's wrath. As mentioned earlier, the stop-motion animation is well done, closely rivaling the movie's CGI counterparts. Meanwhile, the movie's visual look is nothing short of gorgeous, and is especially evidenced by the differences in the two main backdrops. The division between the Land of the Living and the Land of the Dead is as stark as night and day. The Land of the Living is monochromatic, depressing, and blandly dull, while the Land of the Dead is brightly colored, jubilant, and raucously fun. It's as if the Land of the Dead is more alive than the Land of the Living. The uniqueness of the characters works as well, with their expressive eyes and great voice work by the cast. On the music end, Danny Elfman's score is, as always, wonderful. I don't think Elfman has ever composed a bad film score. The jazzy style of music heard in the Land of the Dead is quite befitting of the wackiness and whimsy that realm depicts, while the score featured in the Land of the Living is much more somber, reflecting the irony that is the living world's lack of life. 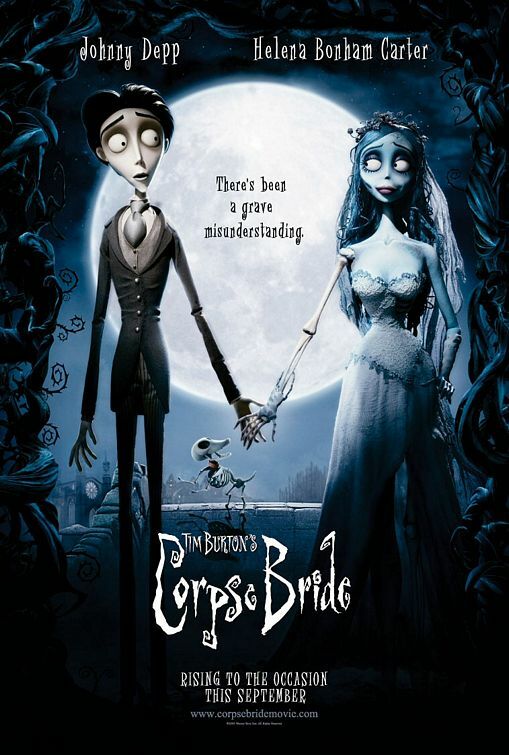 Certainly one of the best in a very slow year for animated movies, Corpse Bride is quite similar to a dark comedy at times, while being surprisingly tender as well. In spite of it being about a man who finds himself married to a corpse, the movie is wonderfully heartwarming. I'm a fan of Tim Burton's eccentric approach to directing, and this gothic love story is another successful venture into animation for him. Corpse Bride is both charming and entertaining, and for that, I'll give it four stars and a hearty seal of approval.